This studio stalwart may be getting on, but it remains a first-choice microphone for engineers the world over. John Pickford explains why. The mere mention of certain brand names will evoke an image of superlative quality – Rolls Royce and Rolex to name just two – and, in the world of microphones, Neumann. 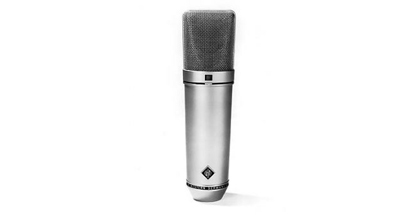 Georg Neumann founded his Berlin-based company in 1928, producing the world’s first condenser microphone, the CMV 3 (affectionately known as the Neumann Bottle due to its distinctive shape). Just over 20 years later the legendary U47 was launched, quickly becoming recognised as a world-class recording microphone. By all accounts, Frank Sinatra would not record with anything else. 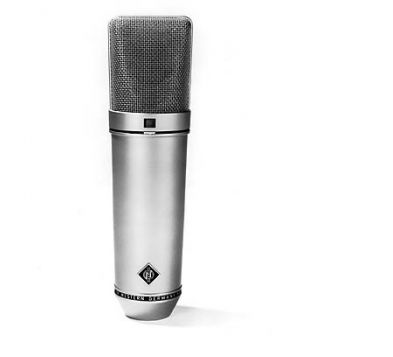 The U47 made use of the VF14 vacuum tube (valve) manufactured by Telefunken; however, in 1958 it was announced that the VF14 was to be discontinued, prompting Neumann to buy up all remaining stock. As this valve was critical to the sound of the U47, Neumann decided to design a completely new large-diaphragm condenser mic, based around the more common EF86 pentode valve that was already being used in the small-diaphragm KM56. Prototypes of the new model – then known as the U60 – were sent to several top studios for evaluation, and when the engineers gave it the thumbs-up, the newly christened U67 went into production, first appearing on the shelves in 1960. An early advert for the Neumann U67 proclaiming the mic as the ‘sound of tomorrow’. Although it was a completely new design, the U67’s capsule was in some ways similar to the U47’s M7 unit, which had been designed for Neumann’s earliest microphones from the late 1920s. For a few years the U47 and U67 were sold alongside each other; however, the new model began outselling the 25-year-old U47 and, with stocks of the obsolete VF14 valve dwindling, the old model was discontinued ins 1965. Whereas the U47 featured two available polar patterns – cardioid and omnidirectional – the U67 added figure-8, which had previously been available on the U47’s lesser-known sibling, the U48. The new U67 also featured a bass roll-off switch, designed to reduce the proximity effect with close-mic’ed vocals, and, uniquely, a 10dB pad switch, making it ideal for dealing with high sound pressure levels such as those produced by the larger and more powerful guitar amplifiers that were becoming popular in the new rock and pop era. Quite apart from its ability to capture loud sounds without distorting, the U67 won many fans with its extraordinarily detailed midrange, helping it to become an industry standard for recording acoustic guitar and piano. While some mics of the period boasted superior low-end response – the AKG C12, for example – and others (including Neumann’s own KM series) could provide a more extended top end, no other mic possessed the rich, smooth, if slightly dark sound of the U67. Most professional studios in the 1960s kept at least one U67, and it can be heard on many of the classic and pioneering records of the era. For an example of the U67’s wonderful midrange tone, listen to the piano sound on The Beatles’ A Day In The Life from the Sgt. Pepper album (see Landmark Productions No.1 for the full story of that ground-breaking recording). By the latter half of the 1960s, transistors were beginning to take over from valves in all manner of electrical equipment, and microphones were no exception. 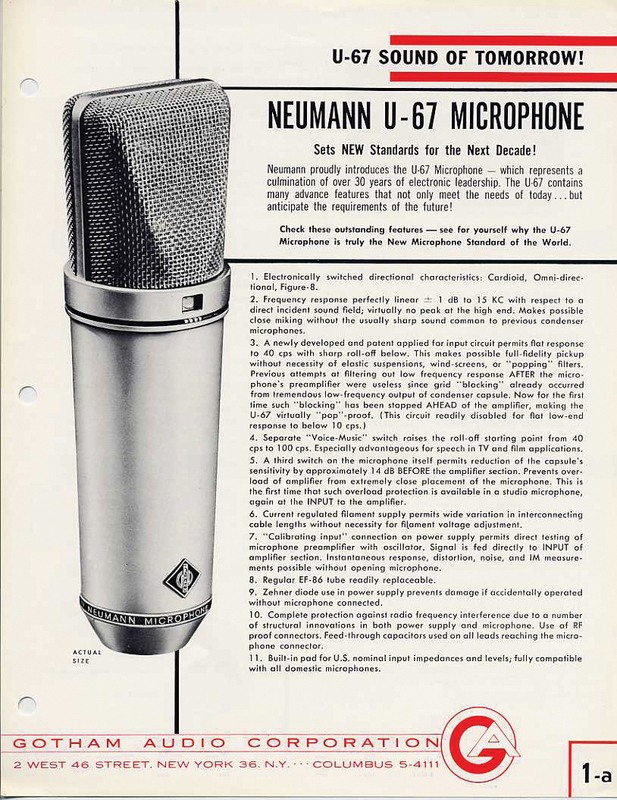 In 1965, Neumann started to produce transistorised mics, with a solid-state version of the company’s flagship U67 appearing in 1967. This new model was named the U87 and is still in production today, enjoying its place as the Rolls Royce of studio mics. Although very good condenser microphones have been produced over the years by respected manufacturers such as AKG, Shure and Sennheiser – as well as relatively new companies such as Røde and sE Electronics – Neumann undoubtedly remains the king of condenser microphones, continuing to set the standard by which all others are judged. And while the U47 may arguably be considered to be the company’s most legendary product, the U67 – along with its solid-state successor, the U87, of course – is surely the most instantly recognisable of all professional studio condenser microphones. Next articleStudio Icons: Vintage Gear Explored!